Do you remember the Flower applique I've made for my headband? 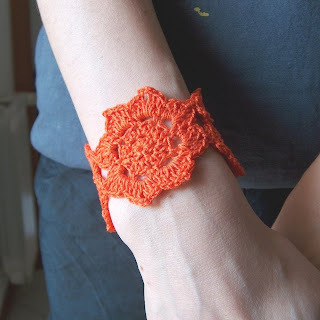 Well, with some changes on the pattern I've made a crochet cuff which is so cute, I think! It's very simple, and it's one of the first times I'm using a crochet hook that it's smaller than the 4.00mm. 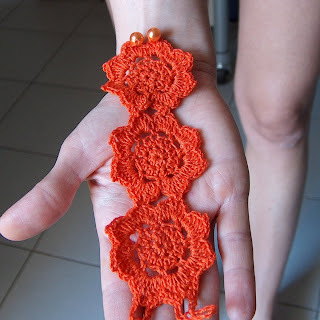 This is made by three Lotus Flower sewed together, and it closes by two beads. Round 4: *3 dc in next ch3 loop, ch2, 3 dc in same ch3 loop, sc in next sc*. Repeat from * around, ending with sl st to previous joining st.
Sew two small beads or buttons on the two petals of one edge flower. I'm so sorry if my english sometimes is not so clear, I will reply to any of your questions with pleasure!